By William Mackay: Robert “The Ghost” Guerrero (29-1-1, 18 KO’s) feels that WBA light welterweight champion Amir Khan would have been knocked out in his fight against Marcos Maidana (30-2, 27 KO’s) last December had the referee working the fight Joe Cortez not broken up the action on many of the occasions where Maidana was pounding on Khan in close. I fully agree with Guerrero. I’ve never seen any fight quite like that one. In some ways, it reminded me of the first fight between Lucian Bute and Librado Andrade where the referee seemed to interrupt what likely would have been an Andrade knockout win after he badly hurt and put Bute down in the 12th. In the case of the Maidana-Khan fight, referee Cortez broke up the action constantly after Maidana had Khan hurt and out on his feet in the 10th round. 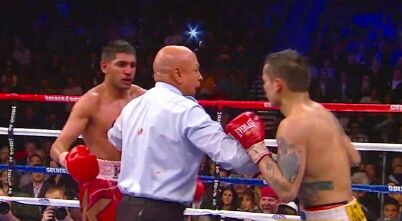 For many of the breaks in the action, Khan was getting hit with one-way traffic from Maidana. Had Cortez just let Maidana fight on the inside during those last three rounds without pulling them apart from time to time, I think Maidana would have easily taken Khan out. Khan ended up winning the fight by the scores of 114-111, 114-111 and 113-112. Despite the bout ending up as the fight of the year for 2010, Khan has shown no interest in fighting Maidana again to try and clear up the controversy. Guerrero, for his part, faces Maidana on August 27th for the WBA light welterweight regular title at the HP Pavilion, in San Jose, California. The winner of the Maidana-Guerrero fight is a possible opponent for Khan. However, Khan is now saying he only plans on fighting one more time at 140 before moving up to welterweight. He’s mentioned Erik Morales as someone he’d like to fight. It’s not likely that either Guerrero or Maidana will get a fight with Khan. « Khan vs. Mayweather – Who would win?